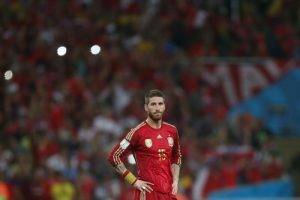 HomeLeaguesLa LigaSergio Ramos Gerald Pique – Feuding Again? Here we go again, people. Buckle up, for the rollercoaster ride that is the up and down relationship of life-long frenemies Gerard Pique and Sergio Ramos. Pique started the latest spat by making a few comments on Twitter, which got him fined by the referee association by the way. The hot take came after Real Madrid won 3-2 over Villarreal. The game was tied before the referee ruled an unavoidable touch of the ball by Bruno Soriano of Villarreal to be a handball, and Real Madrid pushed ahead from the resulting free kick that was awarded. Pique posted screenshots from two Madrid-based papers. One headline, translated for meaning rather than exact words, says, “There is a penalty for Bruno’s hand, but Mascherano’s was involuntary.” Interestingly enough, the headline is saying that, in a similar instance, the referee ruled in favor of Barcelona defender Javier Mascherano while Bruno was unfairly ruled against. That headline effectively nullifies Pique’s argument that Real Madrid receives favoritism because the headline shows that Barcelona receives the same treatment. The other headline says “Bruno’s handball wasn’t voluntary, it shouldn’t have been a penalty.” Pique accompanied the pictures with the tweet the (roughly translated) caption, “Against the same teams, eight points. The magazines are from Madrid because of the doubt.” The doubt mentioned is presumably doubt of Pique’s argument. It doesn’t take a rocket scientist to figure out which tweets Ramos is referring to. Ramos is clearly still trying to replace his bad boy “Redmos” image with the Captain Responsible look, which is certainly an honorable endeavor. Nevertheless, his not-so-subtle dig at Pique comes off very holier than thou. The entire statement is rather hypocritical. Although Ramos may not be criticizing referees verbally or virtually, he certainly was all up in the referee’s face expressing plenty of dissenting opinions when Gareth Bale got a well-deserved red card. Whether or not referee bias actually exists is an entirely different story that would take intense statistical analysis to get to the bottom of. For the sake of argument, let’s just say that at least some of the referees in La Liga are biased. In fact, let’s say that the bias is deeper than the individual and is an institutional bias rooted in the company culture from the head honcho to the receptionist of whatever organization handles the hiring and assignment of referees in La Liga. In this hypothetical scenario, where this grand bias does in fact exist, what teams would likely benefit from it? Follow the money trail! Under the latest La Liga TV deal, Barcelona and Real Madrid are set to earn 150 million and 148 million euros respectively by 2019. All other teams in the league, will earn between 62 million and 116 million euros in the same deal. Rather than being paid an equal amount, each team is paid based on a formula. 50% of the total income from the deal is being divided equally between the clubs. 25% of the income is being distributed on merit, as far as playing, based on the results of the last five season. The remaining 25% of the money is being distributed based on how much the club earns, this includes ticket sales and game attendance. As you see, (cough…cough Listen up, Pique!) Barcelona will make 2 million more euros than Real Madrid. That means that between merit and money making abilities, La Liga ranks Barcelona as being 2 million euros more successful and sellable. These numbers are exactly where Pique’s kooky, “everyone is against me” conspiracy theory crumbles. If there is any bias being shown by referees, both Barcelona and Real Madrid likely experience it, and by likely, I mean they totally experience it on a regular basis. The two feuding footballers really need to sit down and talk out their frenemy relationship. Pique and Ramos…food for thought, boys. Why start drama in the winter when you know that you’ll be best friends again when you’re on international duty this summer? I don’t blame Pique. It’s pretty obvious how Real Madrid has refrees as the 12th man in most of their matches. Real Madrid fans can only see 11. I think we can safely say that both teams have had some instances where the ref may have been taking a water break or something. Haha love the word “frenemies”, brilliant! Describes these two perfectly, especially looking at the first image. They’re teammates at national level, so imagine what kind of backstabbing could be going on in the dressing room. But honestly, fan-side apart, Real has just been better this season, with the help of referees or not. Even if Cristiano is not at his usual level, their team is still the top contender for the title. Also, do you really think that they will shake it off when it’s time for international duty again? I agree that Real is better this season, because they are not a team of three. Sure the two boys should shake it off for international play; they are countrymen…for sure things will be a bit awkward when Road to Russia retuns this month. Let’s see how this plays out. I am not surprised with the spat between Pique and Ramos, it isn’t the first and it wont be the last. This goes on in our Premier League in England, I vividly remember Roy Keane of Manchester United and Patrick Viera of Arsenal having a go at each other in the tunnel before the game started. As your 2 mentioned in your blog, it is usually a clash of similar personalities which will go on until their playing days end. John, Thank you for the comment. When the players don’t play together there is no problem at all. However, when its time for International football, that could be a problem…but luckily they can put their rivalry aside.